Julia is Inspired by music and nature, and always listens to music whilst painting. 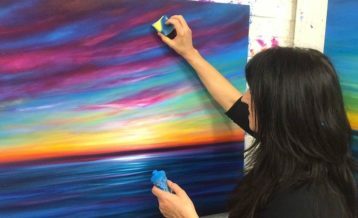 She takes inspiration from the lyrics of such artists as David Bowie, Neil Young and Joni Mitchell, often using the lyrics to title her artworks. Julia loves the sea, and many of her paintings are inspired by light on water, evoking childhood memories of holidays by the sea. Although now living in London, she continues to find particular inspiration from the coastline of Wales and Cornwall, especially Prussia Cove, where she returns year after year. 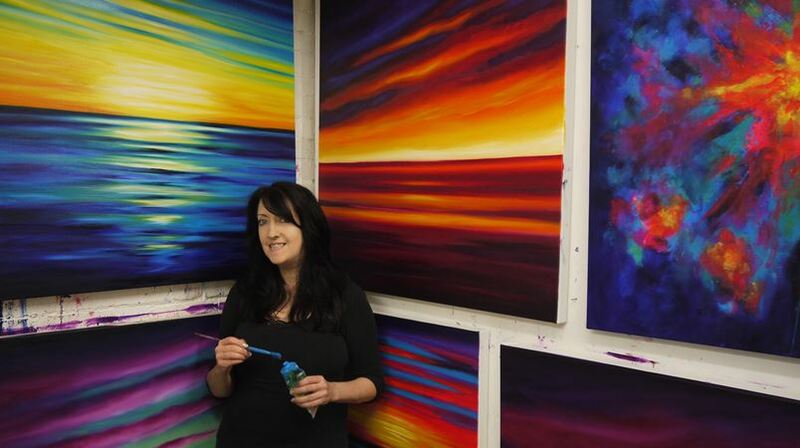 Julia layers and blends the paint in her artwork, producing a beautiful ethereal quality to her work. Her paintings make great focal points for the home or office. Julia is always more than happy to paint commissions, producing specific artworks for your requirements, so please just contact her via Rippingham Art. Can Art Make You Happy?